Back in the mists of time there was an article in FX which looked at the future of retail formats. This was way before online competition became an issue, and when the high street was more or less intact but already suffering certain vicissitudes, largely stemming from out-of-town shopping of one sort or another. From memory, the tenor of the piece was how retail concepts could develop and shopping become more exciting. Amen to that. The only prognostication that I can now recall is the suggestion that future supermarkets would be far from the regimented affairs they had become and would develop along the model of the traditional market, with individual stalls rather than serried ranks of gondolas. I think it was even suggested that you could have a Bangkok-style floating market; actual gondalas in fact. Maybe I imagined that one. At the time, it all sounded rather appealing but a bit fanciful. Rather like the Jetsons’ vision of things to come, there have been palpable developments in that direction but much has failed to materialise universally. However, with the catalyst of online shopping, as we all know bricks and mortar retail, fighting for its life, is developing more rapidly along experiential lines to keep the customer satisfied. 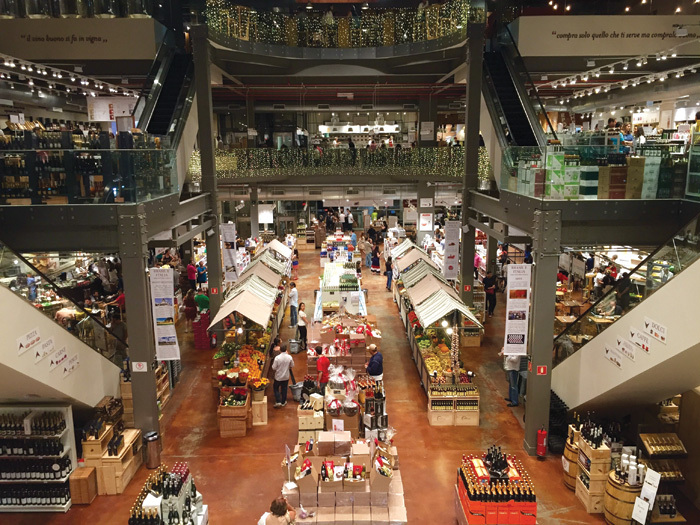 A literal example, the Eataly chain, a ‘multifunctional marketplace’ founded in 2007 by Oscar Farinetti in Torino, has expanded to more than 40 locations around the world. Its concept is simple: ‘to celebrate Italian biodiversity, and create an informal, natural and simple place to eat, shop, and learn.’ Part of the interior concept includes market stalls. ‘We will see more spaces converted to emulate this’, says US-based Ipsos business development represenative Kelly Marie Fairchild in a 2017 market assessment. But on the whole such developments have inevitably taken place in the upper echelons of the market or, especially where food retailing is concerned, the extra-virgin-olive oil, middle-class sector. Food-literate customers seduced by the smells and sensuality of Tuscan or Provençal markets aspire to replicate the experience when back home. Meanwhile outlets by leading brands and design labels have been evolving towards the quasi-religious approach, catholic opulence – there is a deal of gold around – or puritanical minimalism. Not so much a shop as a shrine, where the merchandise sits literally and metaphorically on a pedestal. The fast-turnover, faddish, fashion middle market has inevitably been more experimental, especially where the demographic is young, urban, professionals, though is still often conservative, veering from edgy nightclub vibe (Superdry) to airy creamy neutrals (Zara, Mango, Jigsaw). At the bottom end of the market there is a different approach again. In fact as the emphasis has shifted more and more to cost in both food and clothing and we have seen the antithesis of any attempt to create ambience, with what could be described as anti-design – witness the Lidls, Aldis, Poundlands and Primarks. Stark lighting and the absence of personality promulgates the low-price message. If bricks-and-mortar retail is to survive and even flourish, the formula will involve a whole bunch of factors, including political and economic measures. It will also involve technology as we meld the online with the actual – disquietingly (to the pre-millennial), tracking individual customers through the store with tailored offers and alerts, for example, or enhancing the fitting room experience with virtual or augmented reality. American stores such as home improvement chain Lowe’s are developing and trialling VR rooms, and voice-controlled robot assistants to transform the customer experience, according to a 2018 Telegraph report. But ultimately design has to be the cornerstone. No matter how smart the technology WH Smith might introduce, few would still want to brave its dismal, soul-sapping interiors unless strictly necessary. Distress purchase indeed. To counter (pun intended) the sterility of the online transaction, the retail experience needs to appeal to all our senses, and above all to be visually stimulating, easily negotiated and rewarding. And different. Among the features are lockers which are used to store items reserved online, so customers can come and try them on before buying. A vending machine distributes free items to app users at the swipe of their phone. In the first few weeks, there were queues to get a complimentary pair of socks. The outlet, which has the feel of a pop-up, is divided into different areas, each with their own design identity. At the centre of the shop is the Sneaker Bar, with a curved bar and stools set in an element that appears to be constructed from stacks of white-painted shoeboxes. The store’s footwear is housed inside, with an assistant on-hand to advise on purchases. The store also includes the Dynamic Fit Zone – a lounging area, gym equipment for trialling products, and rooms for Nike experts to offer styling tips. Members can book a 30-minute-long Express Session for a one-on-one service. What is also notable is the degree to which the outlet has been targeted at the local demographic. A curated section at the front of the store is stocked with products suited to a Los Angeles lifestyle, rather than global trends. At the rear of the store, the Local Favorites area displays merchandise most popular with locals, as well as additional colours to attract regulars. 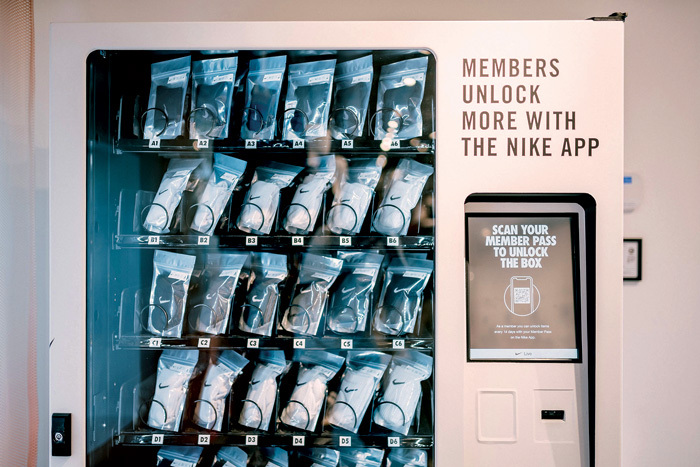 The company has taken data from its apps Nike Run Club and Training Club (apparently provided with the consent of those signing up) to analyse the shopping preferences and habits of its members. 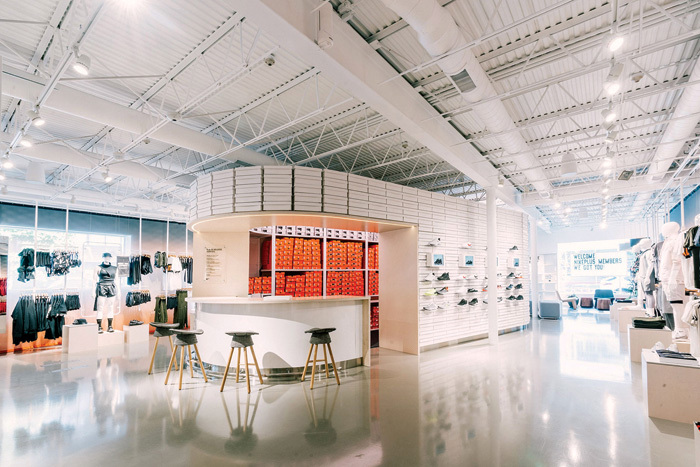 Nike is planning to roll out similar retail experiences across the globe. Tokyo will be the location of a second Nike Live, opening in spring 2019. Two new flagship stores planned in New York and Shanghai will also incorporate many of the features trialled in LA, among other new ideas.